Trying to manage ultraviolet light exposure in California isn't an easy thing to do, particularly when it comes to its effect on concrete sealers. 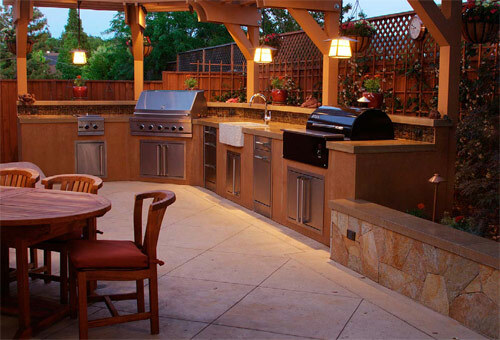 Luckily for Napa, Calif., homeowners Trish and John Danby, Joe Bates of Fabrication was able to get a handle on the situation, creating a countertop for an outdoor kitchen that still looks great more than a year later. "One of the biggest challenges of outdoor work is, of course, the exposure, with UV being the biggest worry here in Napa," says Bates. "It gets stinking hot in the summer, and the kitchen's orientation guaranteed a solid dose of UV year-round." Bates' clients had their hearts set on concrete from the start. He says, "They had done their research and were well prepared with their questions and concerns, which made our job a lot easier. The main concern was sealer. John (Danby) meant what he said when he told me, I'm going to use this thing all the time,' and we had to get it right. It had to be UV-stable and effective as a sealer." Wax was rejected as an option. Bates had no interest in "stinky topical sealers," he says, and the Danbys had no interest in rewaxing frequently. As it happens, at around the same time, Bates had been testing various application methods with Counter Guard First Seal from Innovative Concrete Technologies. Jon Schuler from ICT assured Bates that the lithium-based sealer was completely UV-stable and had excellent stain resistance. So that's what he used. After the sealer was chosen came the actual construction of the countertops, which was no small task. 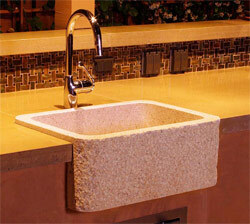 In total, Bates and his two-man crew had to create 78 square feet of countertop. "Trying to get it all on and off our two tables was one of the biggest challenges," Bates says. "We have a small shop." Everything else, however, went smoothly for Bates. "It was pretty straightforward," he says. The countertops were developed with Fabrication's own mix design, which at the start of the job was a simple portland cement mix with aggregate and sand. "Jon turned us on to using more pozzolans, so we introduced VCAS (vitreous calcium aluminosilicate) to it," Bates says. The countertops were then ground to a light sand finish. Since the project was too large to do as one piece, Bates took advantage of the situation and incorporated unique angles at the seams of each smaller piece to add interest. He says the most intriguing aspect of the project to him was simply its large size. In addition to the countertops, Bates and his team also constructed wall caps for the project. Getting identical colors from so many batches was a bit of a struggle, but Bates had some help from manufacturer B&J Colorants. "The guys at B&J were great at educating me on color and UV exposure - what actually gives the impression of color fade and how to avoid it - as well as matching up to the Benjamin Moore paint samples the client had picked," he says. Despite a few challenges along the way, Bates says that all of the hard work has paid off. "The job was a major confidence booster for our shop and has led us to continue to develop and tweak mix designs to optimize sealer performance," he says. "It has also allowed us to actively seek out more outdoor work - a very popular addition around these parts. We made a believer out of Foster Construction, the general contractor, who has since urged clients to use more concrete." The project also proved to Bates that he made the right decision to use First Seal. "It looks as good today as when we installed it, and I've never had to go back except to admire it," he says. "We've used nothing but First Seal since."